When I first started blogging in 2006, the blog was mainly plain text. At that time, I was building the infrastructure of the blog and I didn't want the design to limit or interfere with the infrastructure. It was intended that I was develop the blog in 2 phases seen I will be designing and developing the blog own my own. It was unfortunate that no record was documented about the design (version 0.1). Since then, I have come a long way and learned a lot of development cycle process. I started the infrastructure development middle of 2006 and finished it end of 2006. By most of 2007, I was blogging and my blog was function like every other blog. Throughout 2007 and 2008, managing my blog articles and comments became challenging. I had to revisit the data structure development from time to time to keep my blog going. By end of 2008, I have came out with a robust method to manage my blog content that I am confident with. 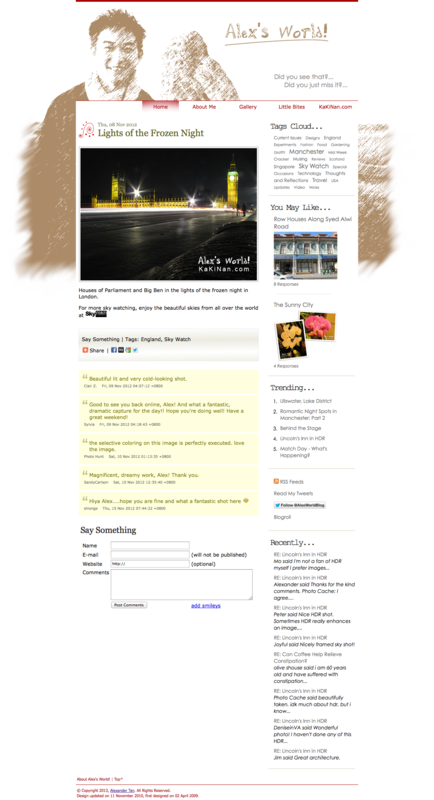 Only then, did I move on to version 1.0: Design my blog. In version 0.1, the infrastructure of the blog was developed and in version 1.0 the design of the blog will be included to add the final touches to my blog design. Since I only do this part time, it took 3 year after I have created my blog infrastructure before I start designing my blog on 2nd April 2009. The process was slow and I have learned a lot throughout the process. Below is how version 1.0 looked like. The image above is the article page for version 1.1. 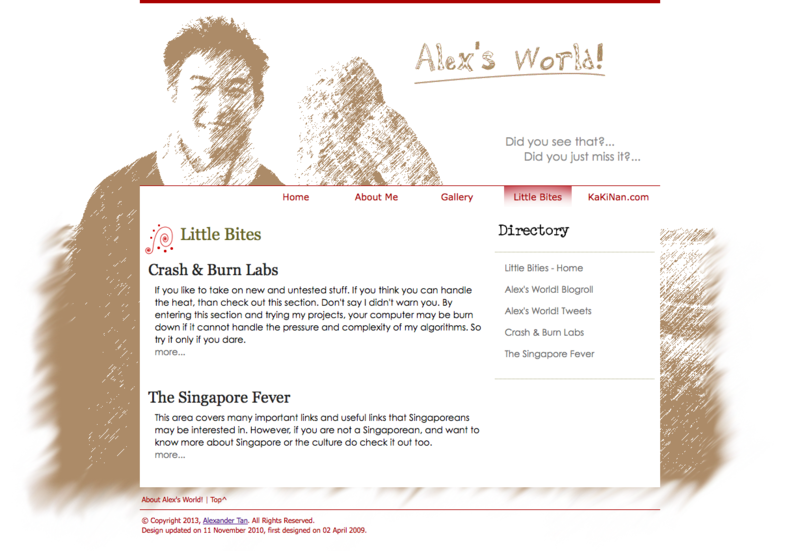 The image above is the main page of Little Bites section for version 1.1. 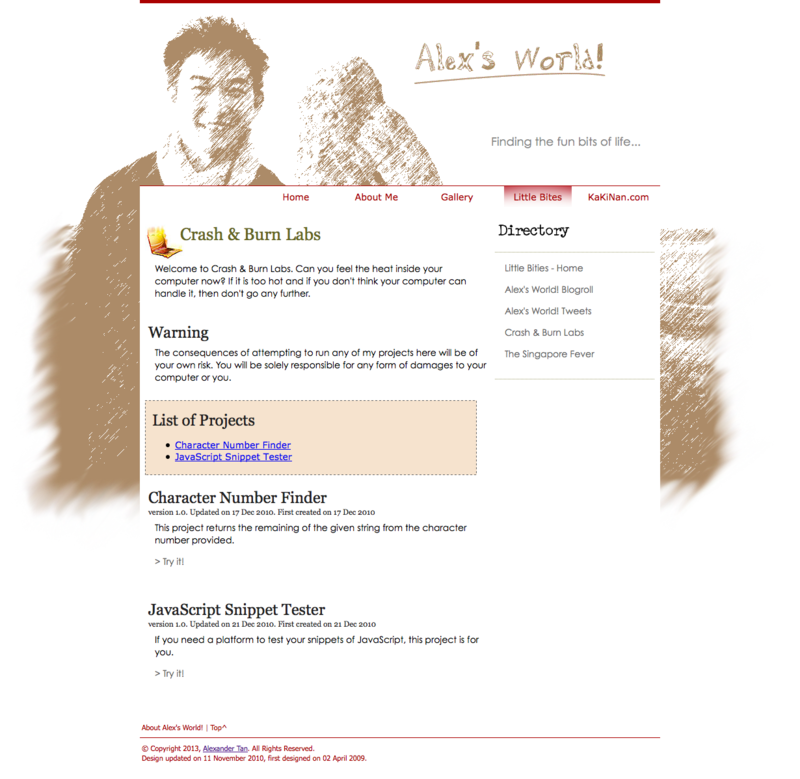 The image above is the Crash & Burn page in Little Bites section for version 1.1. Version 1.2 is Alex's World current version. Why not browse around my blog to experience first hand version 1.2. I hope you will have a great time here and remember to leave your comments about the articles I have posted.